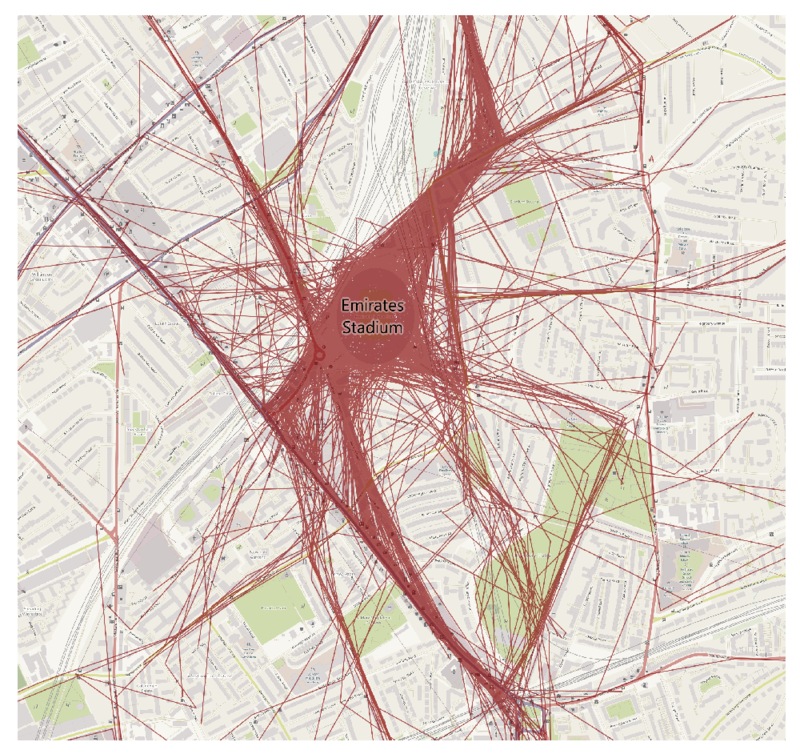 Senior Analyst, Aidan Mcinerney, talks to Location Sciences about how location intelligence was gathered from crowd movements during a North London derby (Tottenham v Arsenal) at Wembley Stadium. As they have done for over 100 years, Arsenal and Tottenham once again battled out the season’s North London derbies – first time around at The Emirates going to Arsenal, with the return at Wembley going to Spurs. The fixture’s most illustrious players and dramatic moments are recollected as if on flickering super 8 film, whether Gascoigne bulleting one of Wembley’s greatest ever goals past Seaman or Joe Baker crashing home in injury time under the old Highbury floodlights. However, it is the fierce rivalry between the two sets of supporters – each hoping to grab the bragging rights – that makes it so iconic. Movement Strategies are working with sports venues around the world, using evidence-based methods to optimise their design and operations to enhance the security, safety and quality of the supporter’s matchday experience. As we help our long-term client, Spurs to their new stadium later this year, we recognise it has become increasingly important to have an individual-centric understanding of supporters. Who are they? Which direction did they travel? Did they walk or take the bus? Did they arrive just in time or go for a pre-match drink? Are these habits or does it change game-to-game? In a space where traditional data collection methods have been limited in scope, granularity and sample size – leveraging the ubiquity of smartphones and Location Sciences’ cutting-edge location tracking capability has enabled us to unlock these insights. Indeed, the image above – from Location Sciences proprietary technology – shows the final approach of supporters attending the derby clash at the Emirates Stadium in November. Whilst half of supporters arrived in the environs of the Stadium in the hour preceding the 12.30pm kick-off, 35% are in the area for up to two hours, 15% even longer. This informs the optimal deployment of facilities, staff and services to best meet the comfort and security requirements of supporters, as they meet friends for a burger or a pint around the stadium and soak up the pre-match atmosphere. By better servicing these ‘early arrivers’, the club as well as the local economy can benefit as pubs, cafes and restaurants make their best offer, in turn increasing the proportion of supporters choosing to arrive earlier. Regardless of derby results – the winners will be the clubs who are able to harness the rich array of insights available to best serve their fans. Author: Aidan Mcinerney, Senior Analyst.